On googling 'will a robot take my job?" I find myself on a BBC webpage that invites me to discover the likelihood that my work will be automated in the next 20 years. I type in 'editor." "It's quite unlikely, 8 percent" comes back. Quite reassuring—but, coming from a farming family, it's a sobering moment when I type in 'farmer': "It's fairly likely, 76 percent". The results may well be out of date—such is the swiftness of change in labour market predictions—but the fact that the webpage even exists says something about the focus of many of today's conversations around the future of work. Many of the discussions are driven by stark numbers. According to a scenario suggested recently by consultancy McKinsey, 75–375 million workers (3–14 percent of the global workforce) will need to switch occupational categories by 2030, and all workers will need to adapt "as their occupations evolve alongside increasingly capable machines." Just recently, online retailer Shop Direct announced the closure of warehouses and a move to automation, putting nearly 2,000 jobs at risk. Automation—or 'embodied' artificial intelligence (AI)—is one aspect of the disruptive effects of technology on the labour market. "Disembodied AI," like the algorithms running in our smartphones, is another. Dr. Stella Pachidi from Cambridge Judge Business School believes that some of the most fundamental changes in work are happening as a result of 'algorithmication' of jobs that are dependent on information rather than production—the so-called knowledge economy. "In many cases, they can outperform humans," says Pachidi. "Organisations are attracted to using algorithms because they want to make choices based on what they consider is 'perfect information," as well as to reduce costs and enhance productivity." "If routine cognitive tasks are taken over by AI, how do professions develop their future experts?" she asks. "Expertise and the authority it gives you is distributed in the workplace. One way of learning about a job is 'legitimate peripheral participation'—a novice stands next to experts and learns by observation. If this isn't happening, then you need to find new ways to learn." Another issue is the extent to which the technology influences or even controls the workforce. For over two years, Pachidi was embedded in a telecommunications company. There she observed "small battles" playing out that could have vast consequences for the future of the company. "The way telecoms salespeople work is through personal and frequent contact with clients, using the benefit of experience to assess a situation and reach a decision. However, the company had started using a data analytics algorithm that defined when account managers should contact certain customers about which kinds of campaigns and what to offer them." The algorithm—usually built by external designers—often becomes the curator of knowledge, she explains. "In cases like this, a myopic view begins to creep into working practices whereby workers learn through the 'algorithm's eyes' and become dependent on its instructions. Alternative explorations—the so-called technology of foolishness where innovation comes out of experimentation and intuition—is effectively discouraged." Pachidi and colleagues have even observed the development of strategies to 'game' the algorithm. "Decisions made by algorithms can structure and control the work of employees. We are seeing cases where workers feed the algorithm with false data to reach their targets." It's scenarios like these that many researchers in Cambridge and beyond are working to avoid by increasing the trustworthiness and transparency of AI technologies (see issue 35 of Research Horizons), so that organisations and individuals understand how AI decisions are made. In the meantime, says Pachidi, in our race to reap the undoubted benefits of new technology, it's important to avoid taking a laissez-faire approach to algorithmication: "We need to make sure we fully understand the dilemmas that this new world raises regarding expertise, occupational boundaries and control." While Pachidi sees changes ahead in the nature of work, economist Professor Hamish Low believes that the future of work will involve major transitions across the whole life course for everyone: "The traditional trajectory of full-time education followed by full-time work followed by a pensioned retirement is a thing of the past." "Disruptive technologies, the rise of the ad hoc 'gig economy," living longer and the fragile economics of pension provision will mean a multistage employment life: one where retraining happens across the life course, and where multiple jobs and no job happen by choice at different stages." His research examines the role of risk and the welfare system in relation to work at these various life stages. "When we are talking about the future of work," he says, "we should have in mind these new frameworks for what people's lives will look like, and prepare new generations for a different perspective on employment." On the subject of future job loss, he believes the rhetoric is based on a fallacy: "It assumes that the number of jobs is fixed. If in 30 years, half of 100 jobs are being carried out by robots that doesn't mean we are left with just 50 jobs for humans. The number of jobs will increase: we would expect there to be 150 jobs." Dr. Ewan McGaughey, at Cambridge's Centre for Business Research and King's College London, agrees that "apocalyptic" views about the future of work are misguided. "It's the laws that restrict the supply of capital to the job market, not the advent of new technologies that causes unemployment." 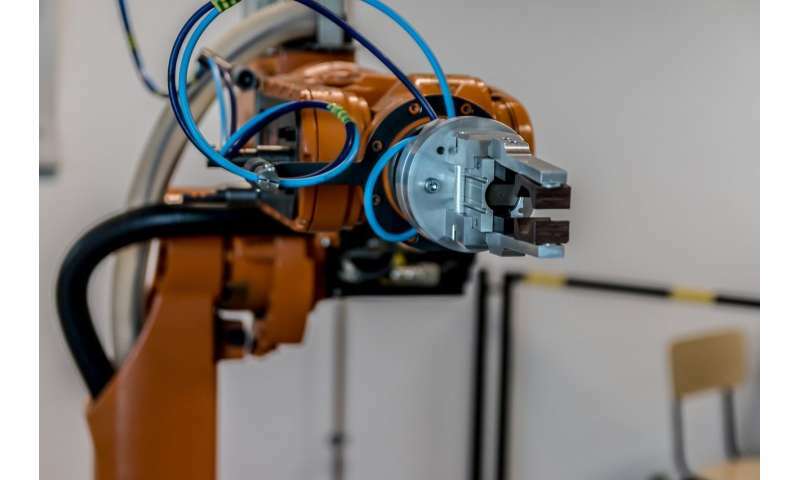 His recently published research answers the question of whether automation, AI and robotics will mean a 'jobless future' by looking at the causes of unemployment. "History is clear that change can mean redundancies—after World War II, 42 percent of UK jobs were redundant, but social policy maintained full employment. Yes, technology can displace people. But social policies can tackle this through retraining and redeployment." He adds: "The big problem won't be unemployment it will be underemployment—people who want to work but can't because they have zero-hours contracts. If there is going to be change to jobs as a result of AI and robotics then I'd like to see governments seizing the opportunity to improve policy to enforce good job security. We can 'reprogramme' the law to prepare for a fairer future of work and leisure." McGaughey's findings are a call to arms to leaders of organisations, governments and banks to pre-empt the coming changes with bold new policies that ensure full employment, fair incomes and a thriving economic democracy. "The promises of these new technologies are astounding. They deliver humankind the capacity to live in a way that nobody could have once imagined," he adds. "Just as the industrial revolution brought people past subsistence agriculture, and the corporate revolution enabled mass production, a third revolution has been pronounced. But it will not only be one of technology. The next revolution will be social."